Bike shorts are the hottest trend of this spring and summer, and this is the most disputable trend – many girls don’t like it as cycling shorts seem to make your legs look larger. 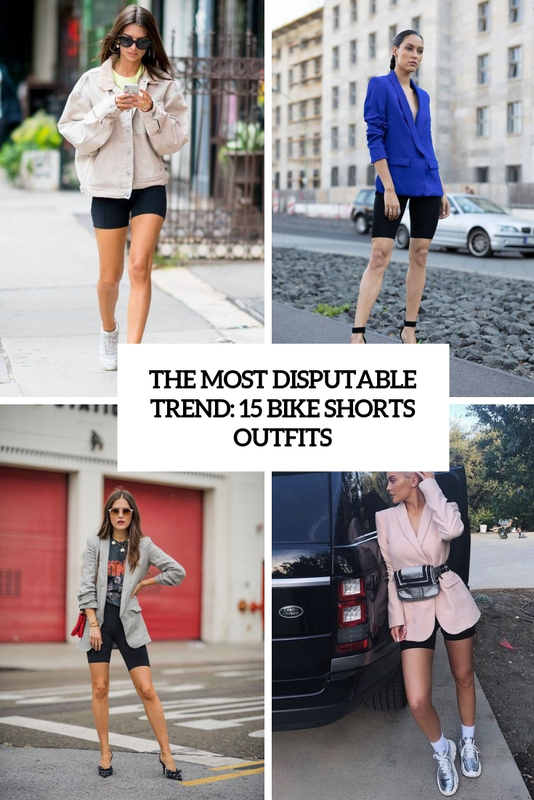 But despite this fact, the most daring fashionistas and celebrities are already wearing them, and if you want some ideas to get inspired, let’s see how to give bike shorts a try. Bike shorts are a sport piece of clothes, so wearing them with some sporty items is natural. Sweatshirts, hoodies, trainers and sneakers plus tees will look totally natural with your bike shorts of any color. This is a very comfy outfit idea with a trend incorporated. Add a bag or a backpack and go! This season cycling shorts are worn with various casual and even work-appropriate items – tees, button downs, blazers, denim jackets plus heels, better slingbacks, which are another cool trend. Rock your bike shorts with sock boots to visually elongate the legs and be bold!